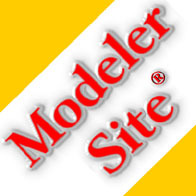 This is may latest model. Therefore you need an European truck with a long wheelbase or you have to make a construction to get enough weight at the frond axel. 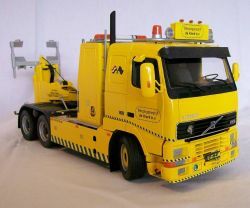 To build this model I have used the Italeri kit No 733. 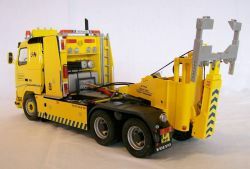 This multifunctional truck is used as a tractor/trailer, truck/pull trailer and a recovery truck. The toolboxes are filled up with recovery equipment. The chassis of the truck is stretched and is haze get a double drive boogie with leaf suspension. 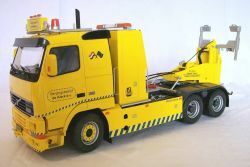 To get more weight at the frond axel the fuel tank was placed behind the cab together with the batteries box and air tanks in a box toolbox. 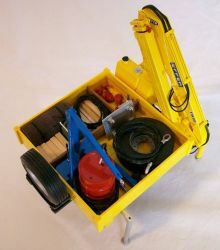 This toolbox compares recovery equipment, lightbar, ladder etc. At the right sit of the box is ladder to climb on the top of the box. 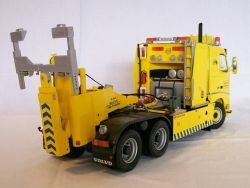 From this point is possible to give instructions to other recovery trucks when winching with more then one truck, or to take survey photo’s. At each side of the chassis were made two large boxes also equipped with tools. At the front bumper was mounted a heavy coupling. The rear of the chassis was shorted to fit the Triple-K underlift as short as possible to the rear axel. 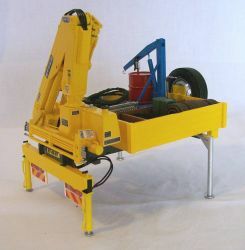 The Triple-K is locket at the front of the fifthwheel with two bars and at the fifthwheel At the rear side it leans at the chassis of the truck. Loading platform with Effer crane. 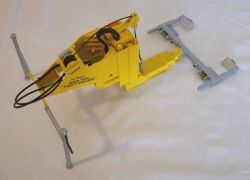 The loading platform was made from plastic sheet and parts from the sparebox The effer crane was OOB from an Italleri. 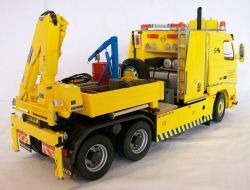 When the platform is placed on the truck it gives extra weight at the rear axels when it is pulling a trailer It is also possible to transport some extra tools and with the Effer crane you can pick-up some load etc. The platform is locked at the fifth wheel and with two twistlocks at the frond. At the rear it is leaning on the chassis of the truck. There are only 2 of this types of underlifts in Holland. I have took lots of photo’s and measurements of one of them. I have made some sketches of it and so I could scratch built the model. When the platform and the Triple-K unit are removed you can use the truck as a tractor. 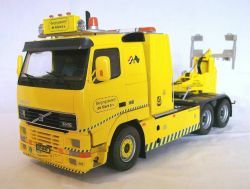 The model was airbrushed in RAL 1021, the colour of the Dutch recovery association. The decals were made in the computer. It is an OUTSTANDING job Erick!!!. I love trucks soo much!!!. Everything is perfect and thank you to show us one of this beautiful machines!. 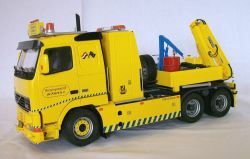 One of my projects is to build a Scania L-440 as a Recovery truck, but many models are waiting to be done and I don't know when gonna start with my Scania's project....... 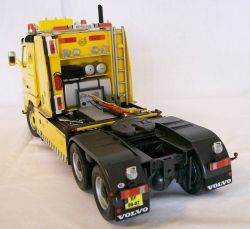 However Erick, this Volvo is AWESOME and I want to congratulate for it!!! !.